This program sets up a multi-person game in which each person chooses whether or not to "volunteer." The payoff for all people in a group is higher if at least one of them volunteers, but it only takes one volunteer for the group benefit to be obtained. Moreover, a volunteer incurs a cost that cannot be shared. The incentives are such that a person who is only motivated by their own payoffs would only want to volunteer if it is likely that nobody else will do so. This is a classic social dilemma game that can evoke lots of class discussion about diffusion of responsibility, strategy, etc. 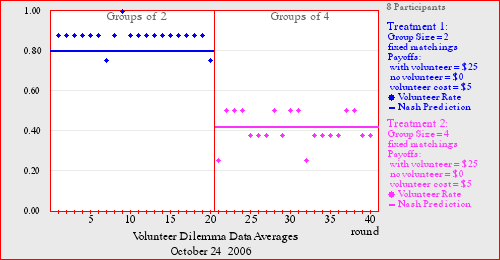 The probability of volunteering should be a decreasing function of group size, as implied by simple intuition and from the mixed-strategy Nash equilibrium prediction. This game is the topic of Chapter 15 in Holt (2006) Markets, Games, and Strategic Behavior.